With over 200 years of history, King’s-Edgehill School has plenty of spooky tales, from shadows walking through the dorms at night to spooky spirits haunting the library. On October 29th, our KES Prefects decided to add their own addition to those tales by constructing a haunted hospital in the basement of the athletic center. Welcome to Harrington’s Hospital and Asylum, home to a myriad of horrors and hauntings. They are always looking for new volunteers to help take care of the patients, as the current ones usually end up residing there after a few shifts. Our student volunteers entered the haunted halls to experience deranged doctors performing gruesome experiments on their patients, lonely spirits haunting the stairwell, and eerie ghouls who tried to keep them from ever leaving. Before exiting the house through a small dark tunnel, the volunteers bore witness to an exorcism gone awry. Fortunately most of them made it through unscathed and with new tales to tell. All in all it was a fantastic night full of screams and fun for the students and faculty at King’s-Edgehill. 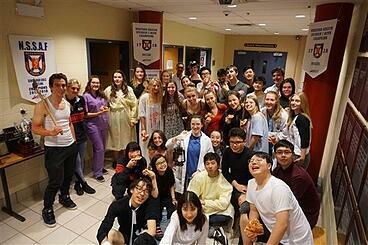 A huge thanks to all the Prefects who helped run the evening’s show and a special thanks to Linus Mulherin. Linus spearheaded the project this year using his knowledge of theater to lead the design team and rally the actors for the production. Without him the night would not have been as successful as it was.